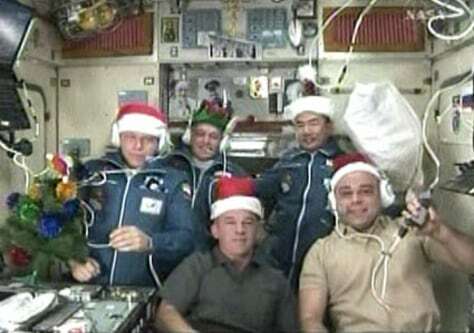 The International Space Station's newly expanded Expedition 22 crew shows off their holiday gear on Tuesday. Front row: NASA's Jeff Williams, station commander; and Russia's Maxim Suraev. Back row: Russia's Oleg Kotov, NASA's T.J. Creamer and Japan's Soichi Noguchi.